We have just released a new version of TMG Reporter v2.0 Beta that includes the following features and critical bug fix to the Fastvue Arbiter. I generally like to talk about exciting new features before bug fixes, but this one is quite critical and warrants being at the top of this post. Some customers using TMG’s default SQL Express logging noticed that TMG was reporting a Log Deletion Failure error, and confirmed that the errors disappeared when the Fastvue Arbiter service was not running. Unfortunately the Arbiter was holding connections to old SQL databases to check if new records were being written to them. This prevented TMG from deleting those old databases when it needed to. We have fixed this so that old databases are not checked for new records once all the records have been imported. This issue only affected customers using TMG’s default SQL Express logging. If you are logging to W3C text logs, you are not affected by this issue. If you are logging to the default SQL Express logs we highly recommend uninstalling your existing Arbiter, and installing this version. Otherwise, TMG may not be able to delete old databases and potentially run out of disk space. With that out the way, here are the exciting new features! Until now, if you ran a report then navigated away from the Reports tab, it was impossible to access that report again unless you shared the report URL by email. In the latest build we have implemented a feature we call the Report Drawer. Clicking the Show Existing Reports tab at the top of the Reports screen drops down the Report Drawer and presents a list of all your existing reports, both completed and in progress. 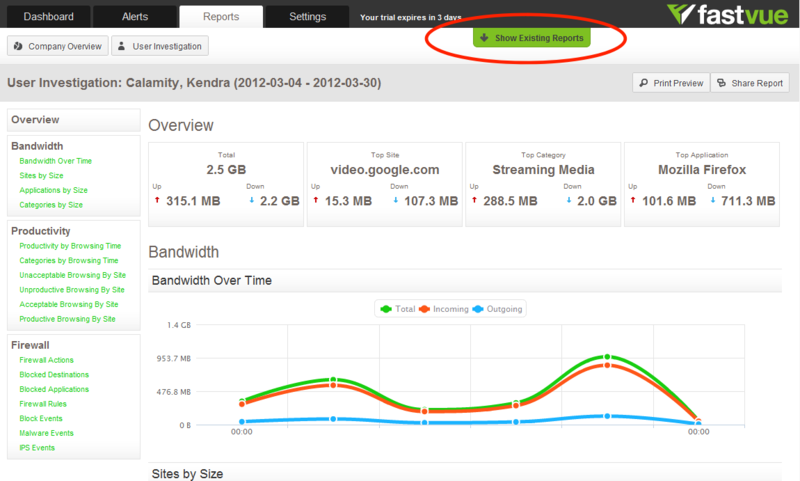 You can re-order and search your reports, and once you’ve found the one you’re after, simply click its name to open it. If the report is still in progress the ‘Generating report’ screen will be displayed, and along with the option to email a link to the report when it is finished. If you attempt to generate a report that has already been created, the existing report will be opened, rather than generating a second duplicate report. For example, imagine you’re using the scheduled report feature (Settings | Reports) to generate a Company Overview report each day. If you go into the Reports screen and select Company Overview report and select a single date, the existing report for that date will be pulled from disk and opened. 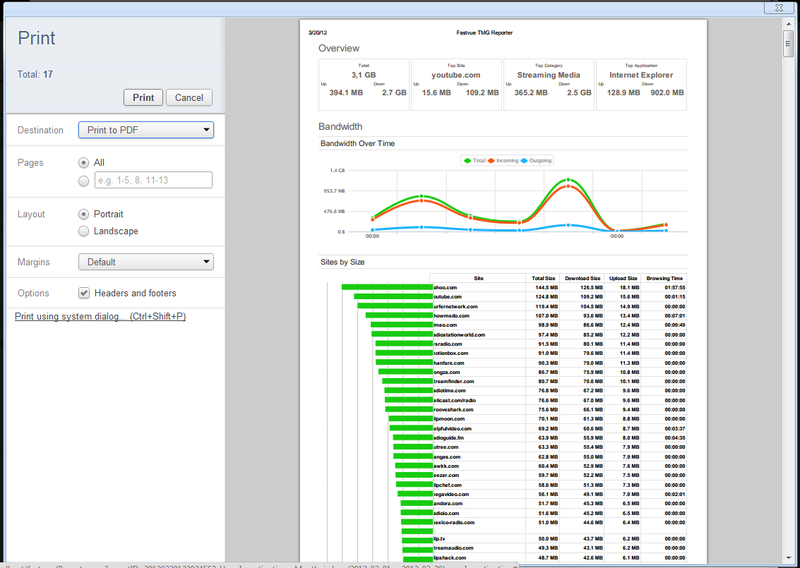 This is much faster than processing the TMG log data for that day all over again to generate the report. The 2.0.0.7 update sees this plan though. Under the Settings tab you will find a Filters option. 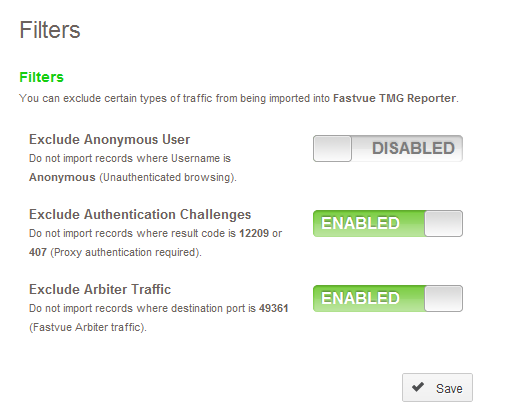 This option gives you the ability to exclude certain traffic from being imported into TMG Reporter. Filters currently include excluding the Anonymous user, excluding authentication challenges (result code 12209 and 407) and excluding traffic from the Fastvue Arbiter. 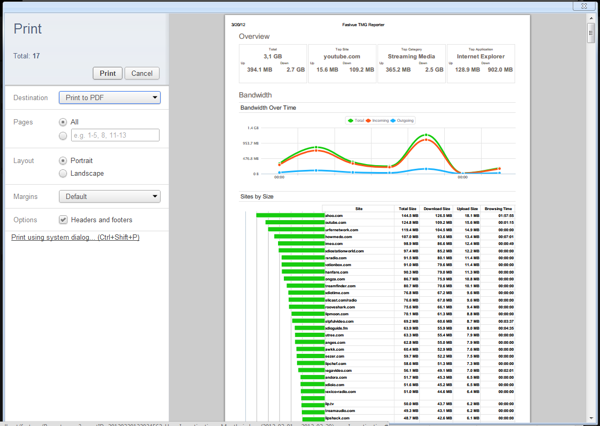 Besides removing unimportant items from your Dashboard and reports, adding filters reduces the amount of log data to process and will improve report generation speed. Sometimes it is necessary to print a report, whether that be to paper or to PDF. You could use your browser’s Print Page function, but that will print the entire web page including navigation elements which aren’t all that useful on paper. TMG Reporter 2.0.0.7 now includes a Print Preview button that launches your report, minus the navigation links etc, in a separate window. There is a convenient Print button at the top of the window that launches your browser’s Print options. You can use this option to easily export your report to a PDF file if you have the ability to print to PDF. If you don’t, there are many free PDF creation tools available such as CutePDF, PrimoPDF, or doPDF. To download the latest build, head to our download page, enter your email address and click ‘Download v2.0 with Reporting (Beta)!’. If you are upgrading from version 1.0, or from an earlier version of the 2.0 Beta, uninstall your existing Fastvue installations (both the Arbiter and Dashboard) and install the latest version of each. When installing the dashboard, you will notice that the default data location has now changed to reflect the product’s name change to TMG Reporter. The default data path for earlier versions was C:\ProgramData\Fastvue\Dashboard. Build 2.0.0.7 and all future version specify the default location as C:\ProgramData\Fastvue\TMGReporter\2.0. If you would like to keep your existing settings (TMG Sources, Productivity configuration etc), you can change the default data location when installing v2.0 back to the v1.0 default path (C:\ProgramData\Fastvue\dashboard), or to your custom specified data location. Alternatively, you can copy the data from the original location into the new TMGReporter\2.0 location. We will be improving this upgrade process before the full release of version 2.0. If you haven’t installed Fastvue TMG Reporter yet, watch our getting started video at http://fastvue.co/getting-started. It refers to version 1.0, but the steps are exactly the same for version 2.0. If you have any issues, please let us know! Nice to have tool for TMG administrators, the reporting seem to be having slight issue as it comes out blank with no data. The alert feature to send mail notification is not working as well. Blank reports are usually the result of a misspelt Username, or reporting on dates where no data has yet been imported. Check Settings | Sources to see the dates that have been imported. 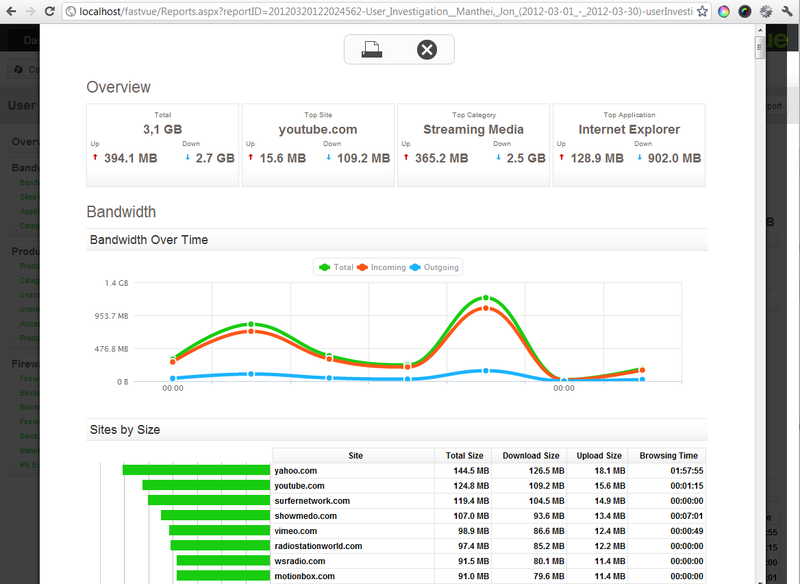 What happens if you run reports from the dashboard? 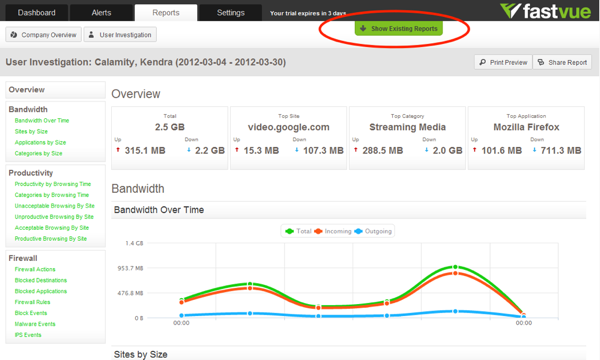 For example, hover over a user and click Run report on…? We have fixed some issues with Active Directory integration in build 2.0.0.12 that we are about to release. When running a User Investigation report, you will see a drop down list of users to select from. This will remove the chance of misspelling a username or forgetting to prefix ‘Domain’. And please let us know if problems persist!